Chicken thighs don’t get their due. 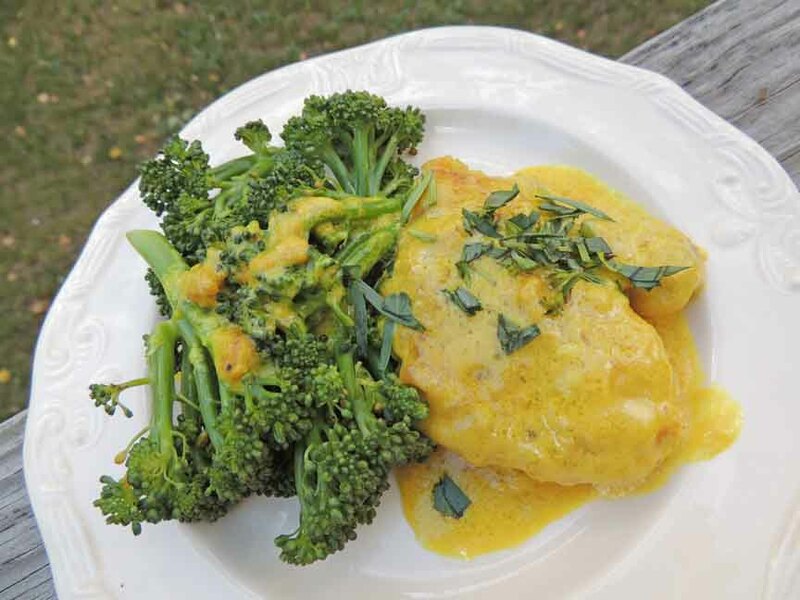 They are the less glamorous cousins of chicken breasts for which many celebrated recipes have been developed, like Chicken Kiev and Chicken Parmesan. Cooks perceive dark meat as less desirable, but thighs are very flavorful, juicy and more forgiving when it comes to cooking time. It’s easy to overcook a chicken breast and end up with a dry result but thighs are fattier so it’s harder to ruin them. Lean meat has for decades been touted as heart healthy but more evidence is coming to light that saturated fat is not the demon we once thought it was. It turns out that sugar and refined carbohydrates are a much bigger problem in heart disease than meat. Also, dark meat contains a high level of taurine, a nutrient that lowers the risk of heart disease. Here are some recipes that feature chicken thighs. Oryana sells locally-sourced chicken thighs from Nature’s Acres in Manton, Michigan. Season the chicken thighs with salt and pepper and dredge in flour. Heat olive oil over medium heat in a cast iron skillet. Cook the thighs about 4 minutes until browned. Flip and cook on other side until browned. Remove from pan. Add wine to pan and scrape to remove any browned bits. Add the chicken broth. Stir in the cream, mustard, and turmeric if using, and cook a few minutes. Return the chicken to the pan and continue cooking, allowing the sauce to thicken and thighs to cook through, about 4 more minutes. While chicken is cooking, steam the broccoli. Add the tarragon to the chicken and stir, coating the thighs with the sauce. Taste and season with salt and pepper. Serve thighs and broccoli drizzled with sauce. Trim the fat from the thighs and cut each one in half. Mix the bread crumbs, Italian seasoning, and 1/2 teaspoon sea salt in a bowl. Whisk together the egg, milk, and 1/4 teaspoon sea salt in another bowl. Dip the chicken thigh pieces in the egg mixture and then dredge in the bread crumb mixture, coating evenly. Heat oil in a large cast iron skillet over medium heat and fry chicken pieces until golden, about 3 minutes. Flip and cook on the other side. Remove from pan and place in a greased casserole dish. Spread sauce over the chicken and sprinkle with the cheeses. Bake at 350 for 30 minutes. Trim thighs of excess fat. Tuck ends under to make a bundle. Place in a slow cooker. Combine minced onions, tamari, sherry, sugar, five spice powder, sesame oil and pepper. Mix well. Pour over turkey thighs. Cover and cook on low about 6 hours or until turkey is tender. Remove turkey from slow cooker and keep warm. Combine cornstarch and water until smooth and stir into cooking juices in slow cooker. Cover and cook on high 15 to 20 minutes or until slightly thickened. Slice turkey. Sprinkle with sesame seeds and sliced onions. Serve with rice and sauce. In a large soup pot, heat oil over medium heat. Add chicken and cook until lightly browned, about 5 minutes. Remove chicken and set aside. Add onions, celery, and jalapeno, and sauté until onions are softened, about 5 minutes. Add chili powders, and garlic and cook another minute. Add the chicken broth, diced tomatoes, tomato paste, corn, chicken, and beans. Bring to a boil, reduce heat, and cook about 25 minutes. Garnish with sour cream and cheddar cheese. Serves 4. Season chicken with sea salt. Mix soy sauce, mirin, sherry, and sugar together in a small bowl. Heat a cast iron or heavy skillet over medium high heat and add 1 teaspoon vegetable oil. Cook thighs about three minutes or until golden brown. Flip thighs over and cook for about 3 minutes or until cooked through. Reduce heat to low and pour the seasoning mixture over the chicken. Cook for a few minutes to allow the mixture to reduce and get thicker and shinier. When it is almost dry, it is done. Serve warm. Heat oven to 375. Season thighs with seasoned salt and pepper on both sides. Wrap the thighs tightly with the prosciutto and place, seam side down in a small, rimmed baking pan. Bake for 45 minutes or until thermometer registers 165 degrees. Marinate chicken thighs in vinegar, olive oil, chive flowers and salt and pepper for 30 minutes. Heat grill to medium high. Cook chicken thighs for 3 – 4 minutes, flip and cook other side until cooked through. Remove from grill. While chicken is cooking, heat the broth to a simmer, pour the polenta into the broth in a thin stream, stirring constantly. Cook for 1 minute or until thick. Stir in cheddar cheese. Heat olive oil in a large skillet over medium heat. Toss in garlic and cook for 30 seconds until garlic browns. Add spinach and toss with tongs, incorporating the garlic, for 30 seconds to 1 minute, until spinach is wilted. Season with salt.